for WARM [WAR + M]? Again, Chambers shows M as an abbreviation only for the capitalized form, ‘Master’, because ‘M’ here is in reality only a component of multi-letter abbreviations, eg MA for ‘Master of Arts’ (so even ‘Master’ for M may be an issue, which will be the subject of another discussion). for STAND [ST + AND], since ‘Street’ with the capital is absolutely fine for ST.
What is the referee’s verdict? 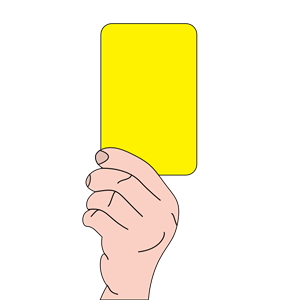 Your views may prompt a reassessment, but the initial judgement is a yellow card – it’s not serious foul play, in that the practice is not unfair to the solver, but neither is it entirely sound.